After faltering for several years, the UK economy shows signs of real recovery, with rising spending, investment, exports and even manufacturing growth. At the start of 2014, there seems to be a virtuous circle of falling unemployment, falling inflation, and rising GDP. After one of the longest and deepest recessions on record, these signs of economic growth are definitely welcome, yet it is far from a return to normality. Real GDP is still 2% below its 2008 peak, and the economy is being propped up by zero interest rates, quantitative easing and a strong housing market. Stagnant wages and poor productivity growth have led to one of the most prolonged periods of declining living standards in memory. Although there is economic recovery, there is still a fear that the recovery is unbalanced, and that the UK economy could be derailed by problems in the Eurozone and future government austerity measures. A difficult question is how much of an output gap the UK has. Since 2008, GDP has fallen away from the trend rate of growth. 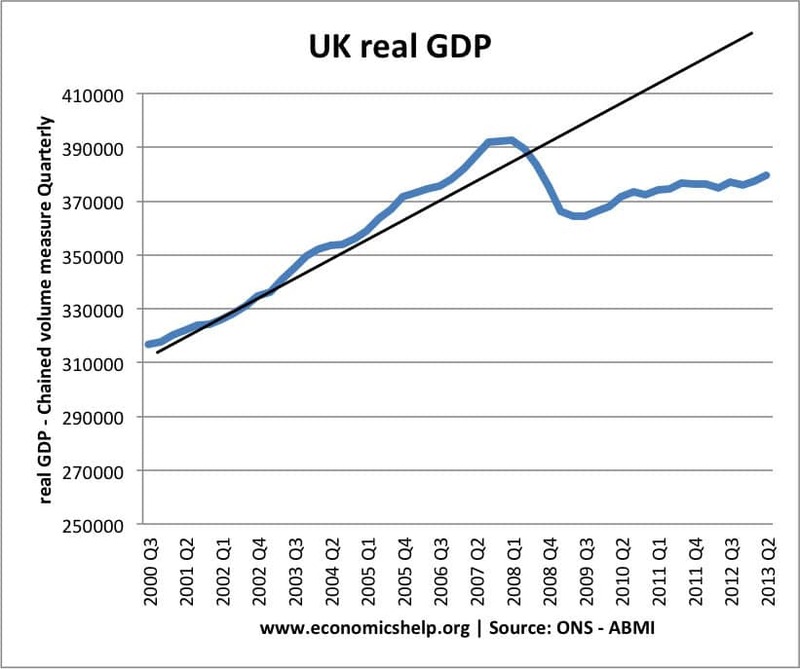 In theory, with output much lower than potential GDP, we would expect a rapid recovery to ‘catch up’ the lost GDP. However, we are unlikely to see this. The great recession has unfortunately led to a permanent loss in real GDP. Economists debate how much spare capacity the UK has. But, for the moment growth rates of 2.5% are unlikely to cause any significant inflationary pressure. 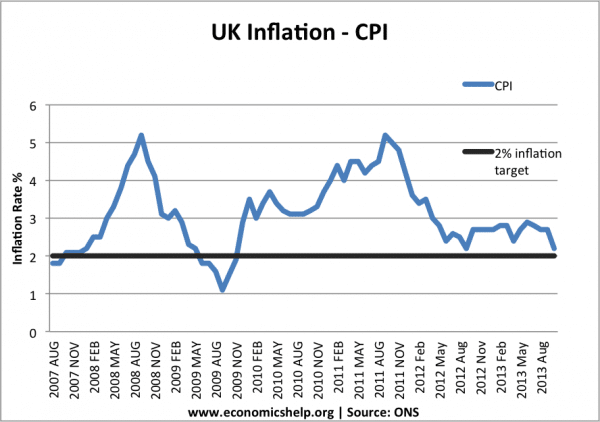 It is ironic that now we are experiencing economic recovery, headline inflation is finally falling closer to the government’s inflation target. of 2%. During the great recession, inflation was often above target due to cost push factors, such as depreciation, rising oil prices and higher taxes. But, now these cost push factors have evaporated, inflation has fallen to 2.1%. Given the nature of the economic recovery, inflation is likely to stay low in 2014, helped by low inflation expectations. However, whilst this unemployment rate is relatively low compared to Europe and also compared to previous recessions, there are other aspects which make less positive reading. Low unemployment has been helped by a rise in part-time employment, temporary contracts, greater job insecurity and falling productivity. (see UK Unemployment mystery) Also, there are pockets of high unemployment, especially in the north, inner cities and amongst the young. Unemployment of 2.39 million is still a serious social problem, and it will need a considerable period of economic expansion to help reduce to more manageable levels. Nevertheless, temporary work is still better than no work. Flexible labour markets have many drawbacks, but it is quite interesting that during the shallower recessions of the 1980s and 90s, unemployment rose to a much higher level. There are also promising signs of firms hiring more workers in areas such as, marketing, sales and business development (FT link) which indicate sign of optimism. Figures for the UK current account have been quite volatile in recent quarters, therefore we need to treat statistics from the latest quarter with some caution. Nevertheless, a current account deficit of 5% of GDP at this stage of the economic cycle is a serious cause for concern. It suggests that import spending is significantly higher than exports; it reinforces the image that the UK economy is still seriously unbalanced relying on consumer spending to boost growth. 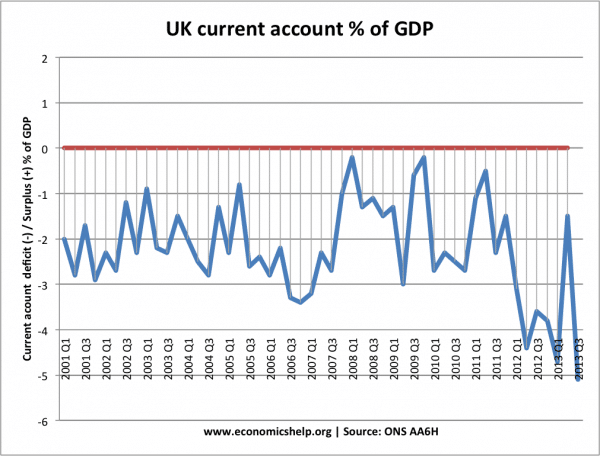 A current account deficit of 5% of GDP is unsustainable in the long term, and will tend to put downward pressure on sterling over the coming months. The real challenge for the economy will be to rebalance growth away from consumer spending towards boosting exports. 2013 has seen a fall in the annual budget deficit to 7% of GDP. 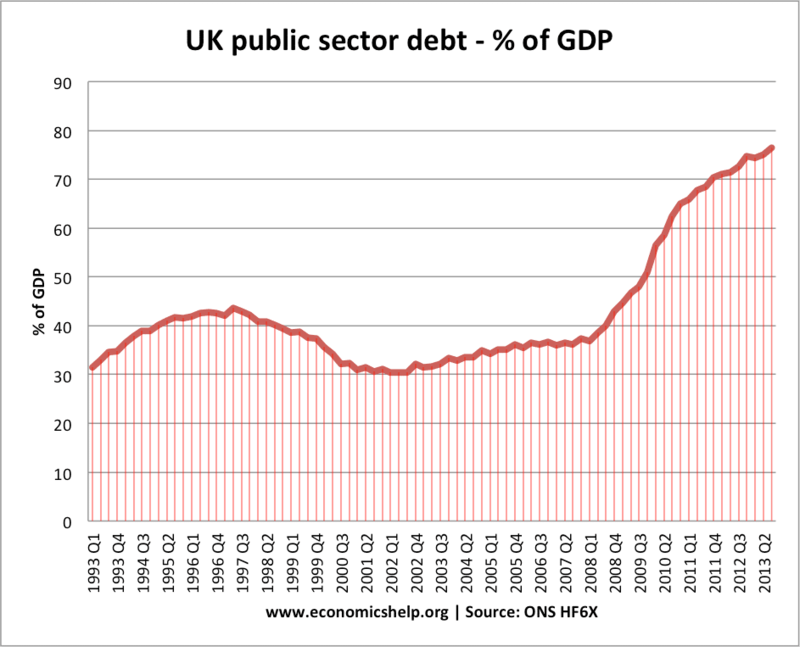 However, total public sector debt has continued to rise. At the start of 2014, total government debt is equivalent to 76% of GDP. Is this level of debt a cause for concern? Some would argue, the rise in government debt is only to be expected given the length of the recession. 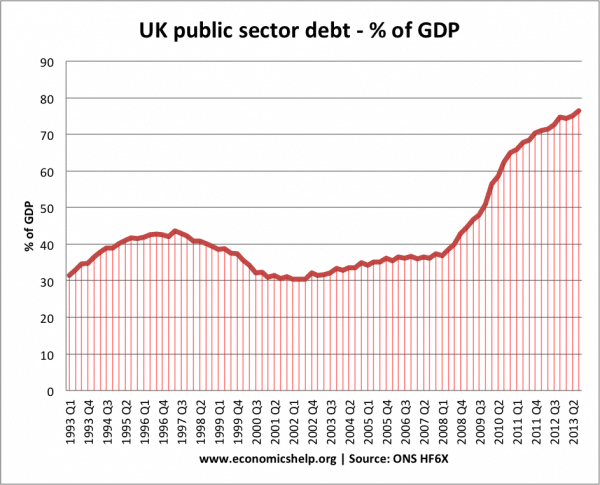 The UK has had much higher debt in the past. 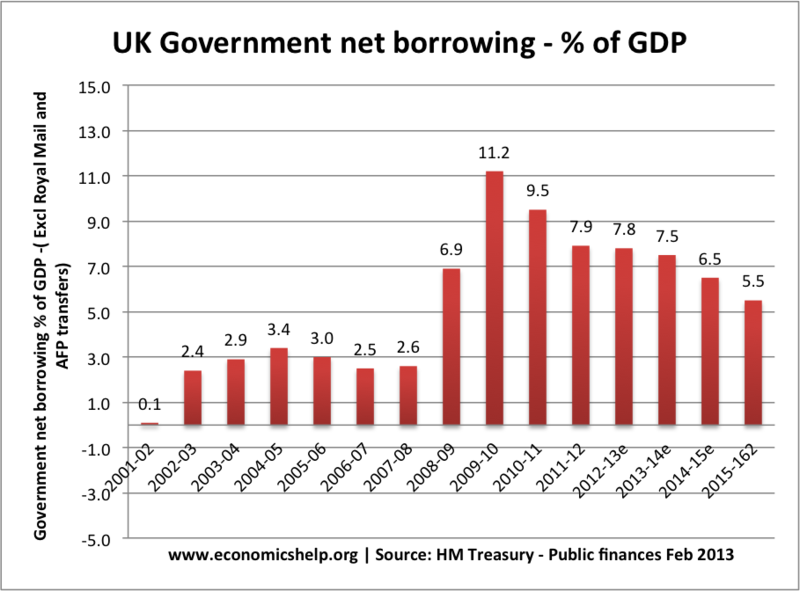 Also, with low interest rates, the cost of government borrowing is very low. Finally, given the weakness of the private sector, it makes sense for the government to play a role in maintaining demand in the economy. Others worry about the level of rising debt, arguing there is a need to cut budget deficits faster. The chancellor has indicated that he is seeking to cut government spending by another £25bn this year to help reduce the budget deficit. The concern is that if the government return to significant levels of austerity it may damage aggregate demand and confidence in the economy – possibly diminishing the recovery. Others argue the private sector will be strong enough to absorb the government spending cuts. 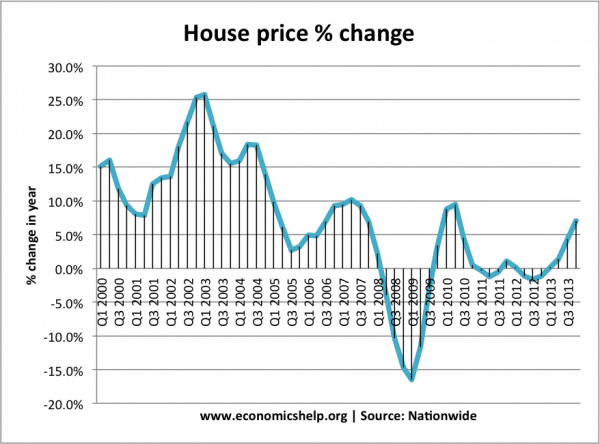 However, the problem is that a strong housing market is causing concern house prices are unaffordable. House price to income ratios are well above long term trends are there is a fear we are in another mini housing bubble. Rising house prices may boost consumer spending in the short-term, but it could be a volatile source of economic growth and damage labour market flexibility. Rising house prices are also increasing the cost of living for the increasing number of young people who don’t own their own home. 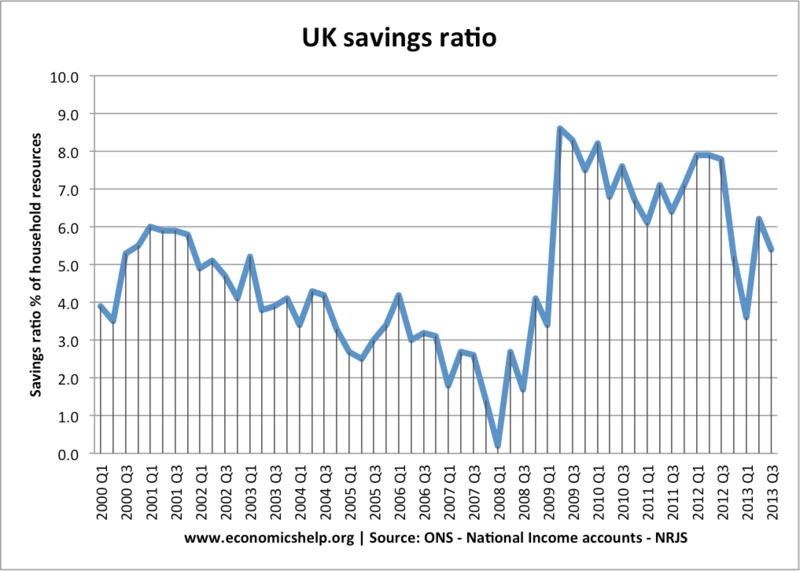 The saving ratio gives an indication of how much consumers are spending compared to disposable income. After the start of the recession, the saving ratio increased rapidly from near 0% to over 8%; this showed consumers wished to pay off debt and increase their savings. 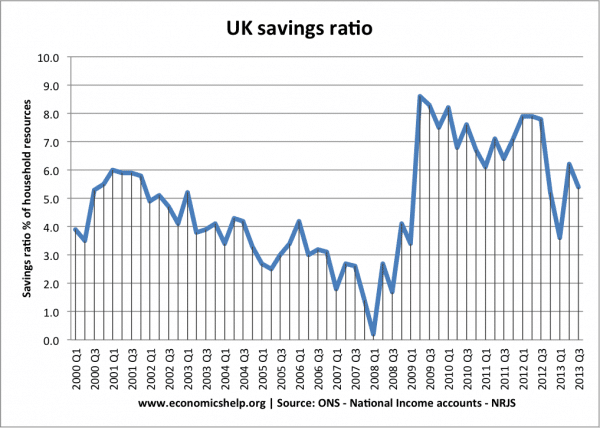 However, since 2012, the saving ratio has fallen as consumers have dealt with stagnant real wage growth by spending through diminishing savings. A saving ratio of 5% is still quite low for this stage of the economic cycle and is another factor that causes concern the UK has an unbalanced growth. There are strong signs of economic growth, with the possibility of growth rates returning to the UK’s long run trend rate of 2.5%. This will cause a virtuous circle of higher investment and spending. 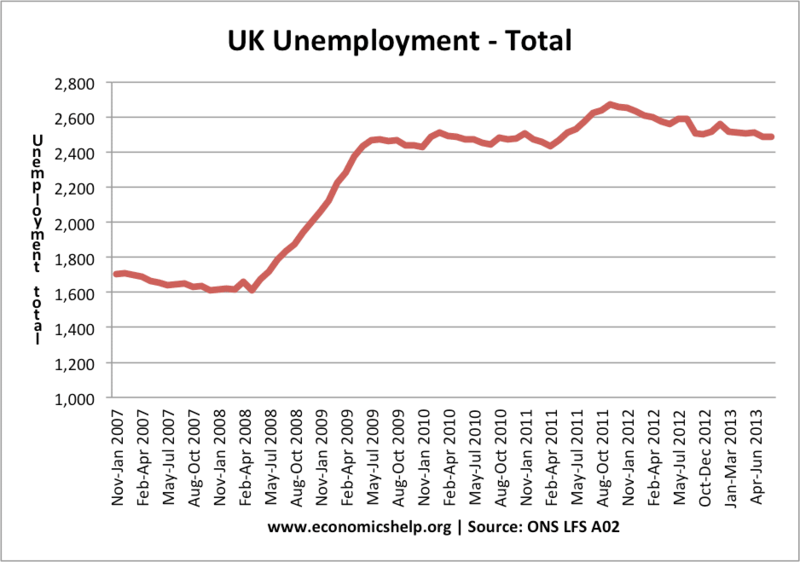 The UK economy has signs of flexibility to prevent rising unemployment we are seeing on the continent. 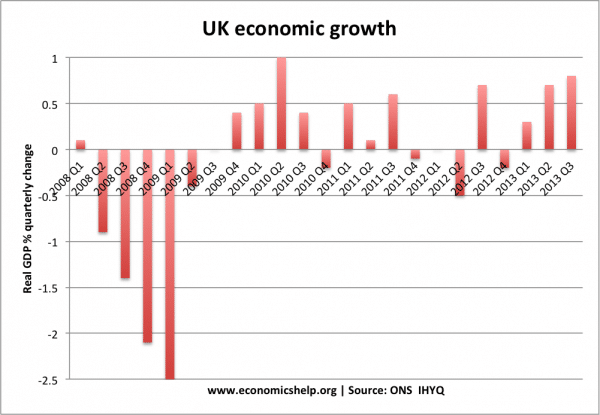 The EU economy is still very fragile and could cause damage to the UK economy in 2014. Prospects of more austerity in 2014 could derail the recovery before it is strong enough. There are probably more reasons to be optimistic in 2014 than any year since the start of the recession. But, there is still a long way to go. There is no guarantee that we will even regain the pre crisis GDP peak until 2015. However, strong growth does make many things easier – it will ease the fiscal burden and give the government a little more room for manoeuvre. This entry was posted in economics and tagged uk economy. Bookmark the permalink. ← What happens if China sells its dollar assets? I really enjoy reading Economics help. It is very informative and clearly written.